Fully-assembled and height-adjustable mobile computer workstation with a wide central shelf, a lower accessories shelf, and 4 gang power as standard. 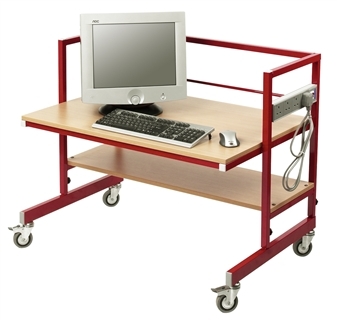 This computer workstation trolley comes in a choice of 3 different widths, and is available in 4 different frame colours. It comes with lockable rubber wheels for easy and safe transportation. A functional and reliable unit for any school or classroom environment. There is an optional pull-out keyboard shelf that can be added too.